Korcula Island is one of the bigger Adriatic islands, boasting beautiful views, secluded beaches, vineyards and olive groves, as well as pretty towns and harbours. 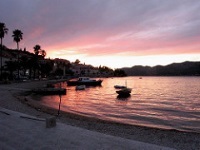 Korcula Town is the island's main commercial area and is situated on the northwest coast. This old town, sticking out into the sea, is typically Dalmatian and often likened to a small Dubrovnik, with its red-roofed houses and enclosing walls. Some theorise that Marco Polo was born here and his rumoured house is now a museum open to the public. The town is also famous for its 15th-century Moreska sword dance which is performed during summer. Other main towns on the island include the tourist centre of Lumbarda, which is surrounded by vineyards and coves, and the port town of Vela Luka on the east coast. Korcula is said to have been a favourite Greek holiday spot over 2,000 years ago and since then it hasn't stopped delighting visitors with its culture and green landscapes. Of the 1,000 or so islands in Croatia, Korcula is often ranked most highly as a holiday destination by tourists.